In contrast to the Leaders Division, which has 3 new coaches for 2012, the Legends Division is rather tame by comparison. But that certainly doesn't mean a few of the coaches' seats aren't getting at least a little warm. We've got some seriously good coaches in this division, so we're going to spend a while here giving each coach our full attention. Kirk Ferentz is now the B1G's longest tenured active coach. He's also in the midst of a downward trend in his winning percentage. For a while there, Ferentz was the class of the league. He was getting NFL and college offers seemingly every off-season. Those days are over, of course, now with Kirk well entrenched with a contract that keeps him in Iowa City til 2016. But it seems clear that the best days of the Ferentz era at Iowa are in the past. No doubt he's one of the best coaches Iowa's ever had. But the past couple of seasons have not gone well. On the field, tough losses to Iowa State, Penn State, and ugly losses to Minnesota the last two years, have definitely taken Iowa down a few pegs from where they were coming off of the 2009 season. But off the field issues have been even worse. We all remember the ugly off-season practice regimen that left 13 Iowa players hospitalized last January. Not a good PR moment for Ferentz or Iowa. 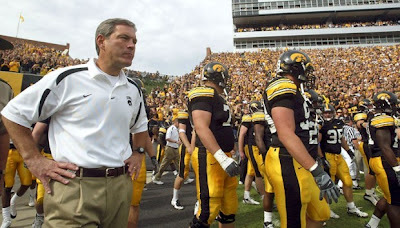 2012 brings new coordinators to Iowa City after the departures of DC Norm Parker and OC Ken O'Keefe. New DC Phil Parker was the DB coach at Iowa for the last 13 years, and OC Greg Davis is new in town from his job as OC at Texas. Maybe some fresh coaching blood will help things along. Iowa is in a bit of a rebuilding mode, along with the coaching staff. Much of the offense and defense is gone from 2011. RB Marcus Coker who had over 1,300 yards last year is gone. As is WR Marvin McNutt who tallied over 1,300 receiving. Much of the offensive line is gone. But one positive note is that QB James Vandenberg is back after a 3,000 yard 25 TD season a year ago. On the defensive side of the ball, much of the D line must be replaced, as well as LB Tyler Nielsen and DB Jordan Bernstine. Clearly, a lot of work to be done for this staff. The schedule does them some favors, with the non-conference slate being rather tame. Only 4 official road games this year – Michigan State, Northwestern, Indiana and Michigan (the opener against N. Illinois is in Chicago). However, the Legends Division is tough this year, so things could get worse before they get better. But Ferentz is an institution at Iowa. To get the heat turned up enough to get him fired, a full-on collapse would be needed for that to happen. And I don't see that happening, not this year anyway. Even given all the new faces in town and young untested players at many of the positions, I don't see a sub-.500 season for Iowa. But I also don't see how they can improve to 8 or more wins. Don't underestimate the importance of the absence of that second "X". Beating Ohio State is always the first and most important priority at Michigan. But when the balance of power in this state is as far out of whack as it is right now, beating Sparty can take precedence. And for 2012, that's exactly what's happening. 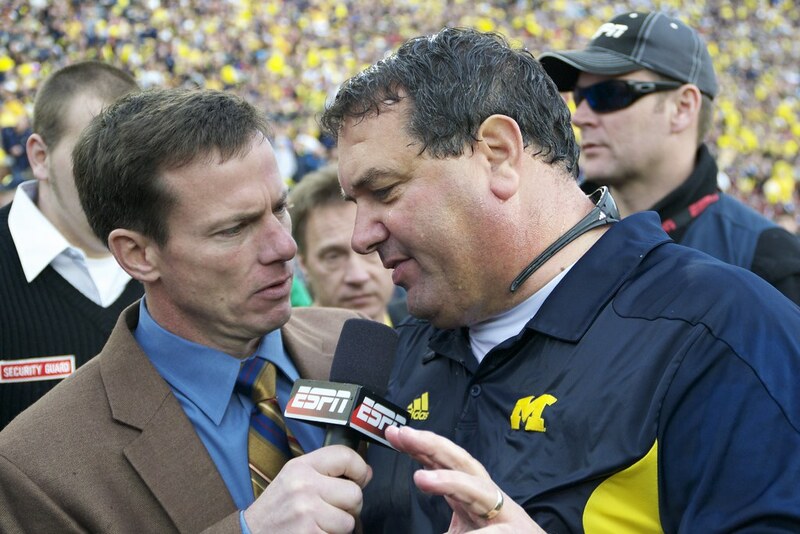 For many casual Michigan fans, Brady Hoke was never the guy they wanted for the job. Not because they didn't like him, they just didn't know him. They knew Jim Harbaugh. They knew Les Miles. People like familiarity...just ask Buckeye fans. So when Brady Hoke took office 16 months ago, many Michigan fans weren't sure what to expect. Eleven wins, a win over Ohio State and a Sugar Bowl victory later, you can rest assured Brady has won over the vast majority of his skeptics. In one season, he, Al Borges and Greg Mattison have taken an average team (let's be honest), and turned them into a BCS Bowl caliber football team. In one season, Michigan's scoring defense went from being ranked 107th nationally in 2010, to 6th in 2011. There was no sudden influx of 5-star talent. No confusing new schemes that fooled every offense we played. Nothing like that at all. Michigan just got better because of coaching. Good old fashioned coaching. It's not easy to pinpoint the exact moment when things just clicked for this team. It's likely to have happened before the season started. But not many folks foresaw 11 wins for this team a year ago, I sure didn't. But what sets apart Brady Hoke from, say, Rich Rod, is that there's just no fluff with Brady. The man is just a football coach...at his core. He doesn't play games, he doesn't try to "politic" his way around things. He's 100% committed to his players and expects nothing less in return. And I think Michigan fans are smart enough to have been able to notice that about him from day one. Look, I know that not every season is going to turn out like 2011. Team 132 was a special team for a lot of reasons. And maybe Team 133 will be too. But no one can argue that things haven't gotten off to a remarkable start for this coaching staff. Not only on the field, but off of it too. There's no drama like there was with Rich. No Free Press articles, no upset former players. And the impact is felt in recruiting as well. The 2012 class that's about to descend on Ann Arbor this summer is ranked by Rivals as the #7 class in the country. And the 2013 class that still being assembled is ranked by Scout at #1 right now. The current state of Michigan football is about as good as it's been since 2006...maybe better. And the future looks infinitely brighter than at any time in recent memory. I can attribute this to many things, but ultimately, it all comes back to Brady Hoke and his influence on this program. Things aren't perfect, they never are, but we're miles away from the dark ages of just two seasons ago. "I find a lot of the things they do amusing. They need to check themselves sometimes. But just remember, pride comes before the fall... This game is an important game. So they want to mock us all they want to mock us, I'm telling them: it's not over. So they can print that crap all they want all over their locker room. It's not over. It'll never be over here. It's just starting... I'm going to be a coach here for a long time. It's not over. It's just starting." I find Mark amusing. They're gonna rename the stadium after this guy. 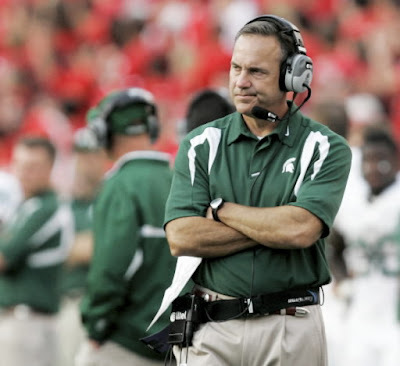 Mark Dantonio has had his moments in East Lansing, it hasn't all been smooth sailing. But when you put as much emphasis on beating Michigan as this guy does, and then delivers 4 years in a row, you can't argue with results. Not even I can. There might not be a more perfect coach for Michigan State than Mark Dantonio. After huge whiffs with Bobby Williams and then John L. Smith, Mark has been exactly what the doctor ordered for Sparty. He puts the Michigan game on a level higher than any of his predecessors...maybe higher than even a few at Ohio State – where Mark was defensive coordinator from 2001-03 and a GA back in the 80's. His hatred for Michigan runs deep. And that's what Sparty loves about him – if their black hearts are capable of such a complex emotion. His loathing for Michigan aside, Mark has had quite a run so far...especially the last couple years. "Little Giants" – the fake FG against Notre Dame in 2010, and then the Hail Mary to defeat Wisconsin last year were both high water marks for the Michigan State program. Of course the multiple collapses in 2009 and struggles in bowl games have hindered what could have been one of greatest eras in Michigan State football history. But success against Michigan has kept him in good standing among the fanbase. You could argue no program has benefited more from Michigan's struggles from 2008-10 than Michigan State. But even then, all they have to show for it is one co-Big Ten title (2010) and a Legends division title (2011). A BCS bowl and high national rankings have eluded Michigan State during this successful stretch. And now with Michigan seemingly on the rise and Nebraska also a contender in the Legends Division, the bar has been raised for Dantonio to maintain this level of success. Their defense in 2011 was very good, and they bring back 8 starters from that unit. The offense was average, and will need to be rebuilt this year. Well, I guess Jerry found out what football is like in the B1G. It's not exactly like the MAC or the Gateway Football Conference where he made a name for himself. But I can't pile on him too bad. It is Minnesota fergodsakes. And you can't judge too harshly after just one season. But you sorta can. Because Minnesota is not Indiana. There is a strong football heritage there. It's very old and in need of a facelift, but its there. 2011 was not good. However a very close loss to USC in week 1 was thrilling to watch. But as losses began to mount, by the time they showed up in Ann Arbor, one week after coach Kill suffered a seizure on the sideline against North Dakota State (his second seizure during a game that year), Minnesota had no answer to Michigan's attack. They lost the game 58-0. A close win against Iowa three weeks later and another win against a defeated Illinois team the final week of the season mercifully closed out a tumultuous year for the Gopher program. Its never good when a head coach dominates the headlines because of his health. But that's exactly what happened last year. I would like to think that Minnesota is a program on the rise, because I think a good Minnesota team is good for business in the B1G, but until I see any sign of life from this squad, I think it's going to be par for the course for a while. The B1G is getting stronger, and especially this division. That won't make life much easier for schools like Minnesota. 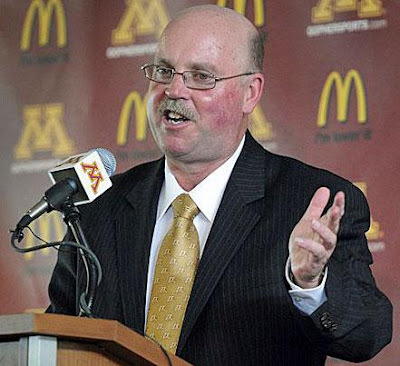 Jerry Kill is a good coach, his track-record proves that. But time will tell if he can cut it at this level. They don't have particularly great numbers returning. QB Marqueis Gray is a good all-around athlete, and they might be able to build something around him. Leading rusher Duane Bennett is gone, as are leading receivers Da'Jon McKnight and Collin McGarry. So there's some rebuilding of the offense that needs to take place. They lose their safeties and the interior of the DL. Safety Kim Royston was one of the best at his position last year. He will be missed. Well, mark me down as a guy who thought 2011 would go much better for Nebraska than it did. I'll admit it, I drank the Kool-Aid. I thought they would make a splash in the B1G in year one. That's not an indictment of Pelini, but more of a statement about how good the league is. I mean, yeah they won 9 games, but I had them in the B1G title game. That loss to Northwestern was a killer. How we beat them 45-17, I'll never know. That was maybe one of the most complete games I've seen from a Michigan team, against a quality opponent since probably Notre Dame in 2006. However, I do think 2012 is going to end up being much better for the Huskers. More on that later. Given Nebraska's position as new kid on the block in the B1G, I'll reserve any harsh judgement for now. They do have some strong players coming back, so a step forward in terms of success should be expected. QB Taylor Martinez and RB Rex Burkhead are very good athletes. Leading receiver Kenny Bell is also back. And no major area of the defense gets decimated by attrition. The schedule looks a little more inviting than last year's gauntlet...barely. They still do play Wisconsin, Penn State and Ohio State from the Leaders Division. They did handle Ohio State and Penn State well last year but did lose to Wisconsin at Camp Randall in their first ever B1G game. 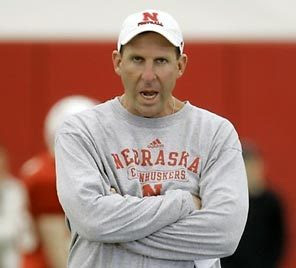 As far as I can tell, the Nebraska fanbase seems to like Pelini. He seems like a good fit. I do hear his name mentioned for coaching vacancies, but he's still in Lincoln so I guess that means something. His past assistant coaching stops in the NFL have probably added to the skepticism that he could one day leave to go back. Nebraska is Bo's first head coaching gig. I'm almost at the point where I don't think Pat Fitzgerald can do anything wrong in Evanston. Mainly because the only NU fans that give a damn are willing to give him a lifetime pass because of who he is. But I really do think they know that they'll never get a better coach to come to NU. I think they're just willing to wait until the next dynasty stretch comes along. "Let's not rush it." Pat will get a big win here and there. His teams do play pretty well, all things considered. A lot of schools like to profess that academics come first, but NU really means it. So football is just a necessary evil. But when you have a great standup coach like Fitz at the helm, it makes the sport more tolerable on campus. He was once offered Notre Dame and Michigan and turned them both down. So there's that. He's clearly happy at NU. Last year we said he needed a good year. But he didn't have one. He had an average year, and they went to a bowl (who didn't...amiright?). So you have to ask yourself, does the "hot seat" even exist in Evanston? 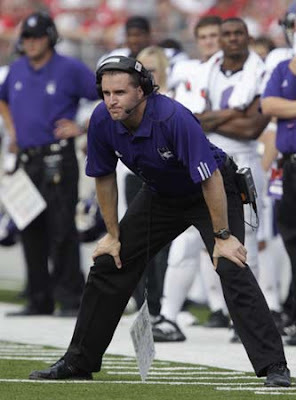 Win or lose, or probably somewhere more likely in-between, lives Pat Fitzgerald. And he isn't going anywhere. Did you miss the Leaders Division Hot Seat post? Well click on through my good man. We luv Coach Ferentz as a coach and teacher.Nobody put's as many guys in the NFL outside of Alabama and a couple others over the last 5 years.